It’s an amazing and gorgeous day here in southern California. While the east coast and Canada are being buried underneath snow drifts, the sun is shining and the sky is clear. The temperatures are expected to reach 80 degrees by Saturday and then slowly descend down into the mid-70’s by the following week. No wonder so many people want to live here. Our weather is very appealing and there is no snow to shovel and icy roads to navigate! With all the rain that has fallen in the last two months, my garden has exploded in growth. Several plants are starting to bloom and many bulbs are coming up through the earth and everywhere I look, I see something new and changes in the landscape. 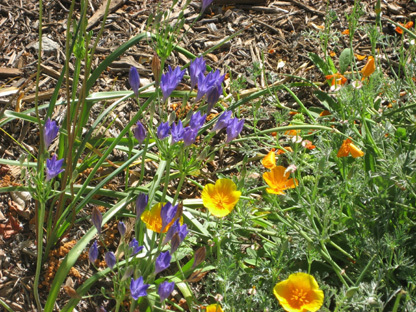 There are lots and lots of California Poppy seedlings and I know I will have a visual feast of glowing, orange flowers within the next couple of months. It’s really too early for this kind of activity and I guess you could call it a “false” spring, as we could still have some very cold temperatures, as it’s truly winter. And if that should happen, it will kill or at least cause some of these early bloomers, to die back. The warm sunshine has brought many different types of birds into the garden and they are feeding on the seeds they find as though they are at a banquet. And I half expect to see some lizards due to the warmth but I guess they are still sleeping, tucked away under the rocks. They know it’s not Spring as of yet.